Well we had to do it. What started out as a quick, minimal disassembly of an Elite Batmobile to grab the batphone for molding for the upgrade kits turned into a full exploratory session. And we uncovered some interesting finds in the process. Next, as you can see in the upper left corner of the photo below – the turbine engine is part of the front wheel assembly. Easy to remove but interesting physics going on there. I know it’s a fictional engine but – yeesh. The sooner I get a Ford 390 in there the better. Next, we had heard this but hadn’t experienced it until now – the Elite seat-tops are rubber and removable. And the silver trim bottoms come off easily as well. All the better to try some of Futurabat’s new seat designs out on them. Probably the most interesting thing we discovered was that the 2-piece chrome dash pops right off. This will make installing the photo-etched dash panels that much easier. I’ve got to say – I’ve ragged on Mattel a bit but they really optimized this model for upgrades! 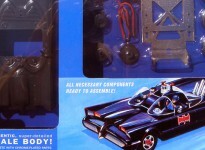 They should put all the parts in a box and call it the “Custom Batmobile” edition. Hey Scoot, are you making an upgrade for the ELITE only or will it work on the STANDARD as well? I’ve got a couple of spare STANDARDs, but I’m not investing in any more ELITEs thank you! And OK, I know this is a dumb one: Any ETA on the upgrade kit? Shoot! Now that all of the thugs on the street will know that a “stripped” Elite is much more valuable than a standard one, I better keep mine off the streets at night and locked up in my Batcave (err…carport). The differences you found underneath are really interesting! I sure wish the Standard was as easy to work with as the Elite apparently is, because I plan on doing almost nothing to my Elite for upgrades. But even as lazy as I am, I still have a bunch of changes I want to make to the Standard I have disassembled.